With your library card you have access to a number of great digital resources. You are able to download and borrow music, movies, TV shows and more! OverDrive: Download and borrow eBooks for FREE with your library card. OverDrive is the library’s primary eBook and audiobook lending site. Digital Magazines now available! 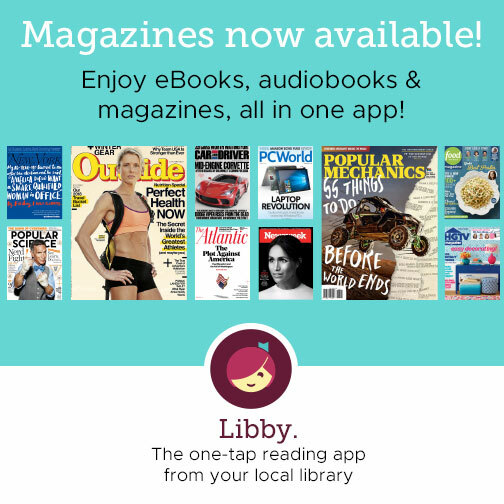 Check out OverDrive’s new, easy-to-use app, Libby. FREE app to download to your device. Need more help? Check out the OverDrive Help Page. Hoopla Digital: Borrow and stream FREE music, movies, TV shows and audiobooks with your library card. NO WAITING! ALL CONTENT ALWAYS AVAILABLE. You can check out items for one week and borrow 10 items per month. You can even download items to have them available when you aren’t connected to the Internet. Flipster: Read popular magazines cover-to-cover on your computer or mobile device. Titles available include, People, Entertainment Weekly, Sports Illustrated & more! Need technology help, but don’t know where to turn? That’s one great service the library has to offer! Get FREE individual one-on-one technology help! While Pam can’t repair your computer if it has a virus, she can help you learn your new phone, teach you a Microsoft Office, assist you in applying for a job and much more! Call Pam to set-up a one-on-one technology session to get all your questions answered. Call 412-885-2255 email her at: calfop@einetwork.net.